It was about this point when we looked at our schedule/calendar and realized that we weren’t sure we were going to have enough time to find an apartment and unpack before Chris started his job in October. So we decided shorten our trip by about five days. 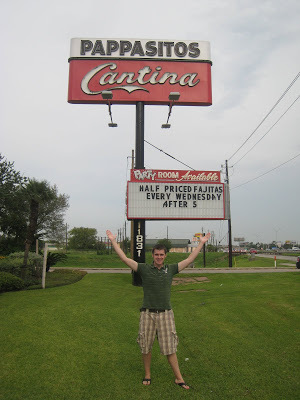 This meant that our only stop in Houston, Texas was for dinner. But we couldn’t have picked a better place for dinner. Pappasitos was delicious!! We loved it. 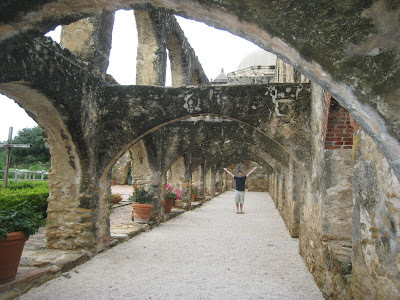 We had one day to see San Antonio. 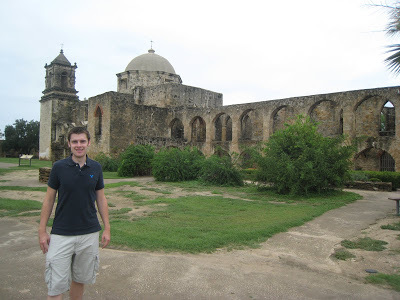 Our first stop was the Mission San Jose. 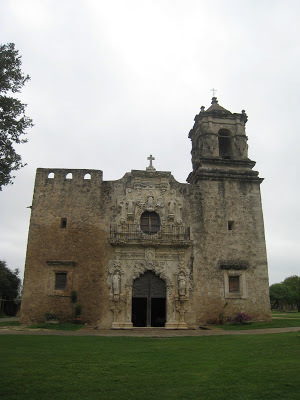 This mission was founded in 1720 and served the Coahuila indians. This area has been used for quite a few different purposes over time. It was interesting to read about how the mission and surrounding areas have changed and finally been preserved. And this is…. THE ALAMO! We remember. 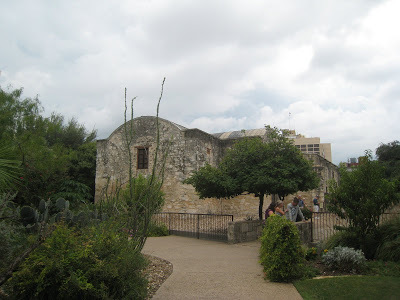 Several weeks prior to coming to San Antonio we watch the movie The Alamo. 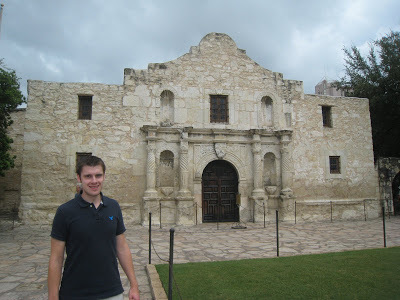 Since neither of us really knew anything about the Alamo we thought it was very helpful. When we walked through the building and read the signs that told of the history we understood what it was referring to because we already had an idea of what happened here and why it was so important. 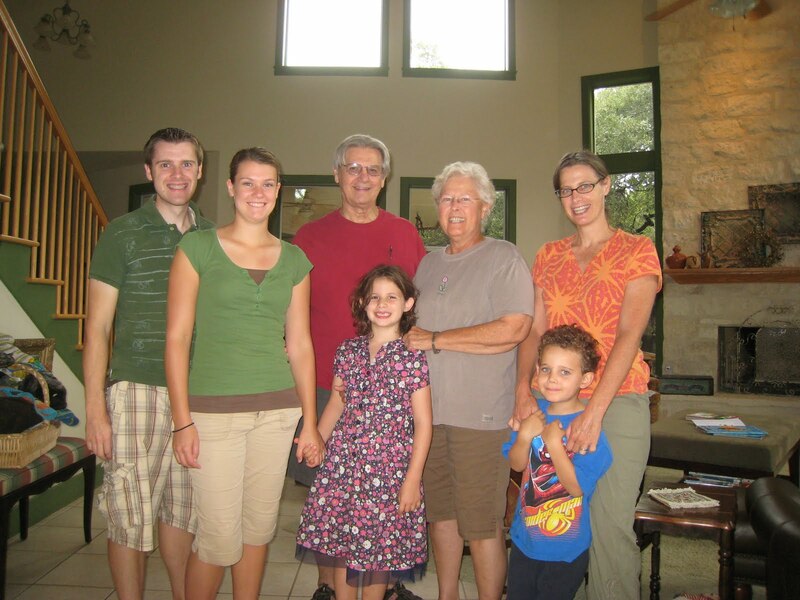 Our couchsurfing host was a family living just outside San Antonio. They had two children who were so much fun. They were very excited to have us stay with them. 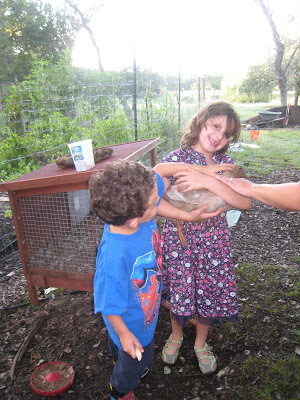 They wanted to show us all around the house and Zia even showed us their pet ducks. 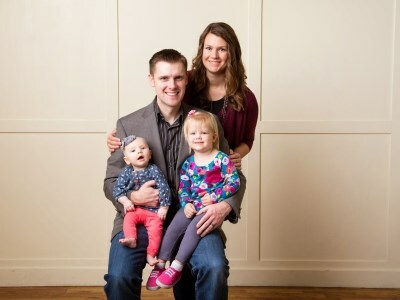 This is a picture of the whole family. They were wonderful hosts, and we had a great time getting to know them. 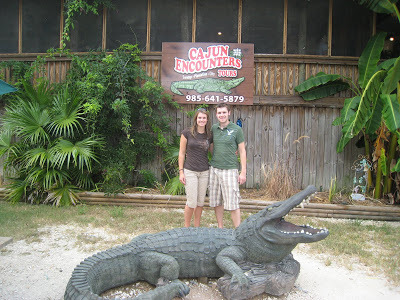 While in New Orleans, Louisiana we found a company that gave swamp tours. It was a little ways outside of the city, but it was well worth the drive. 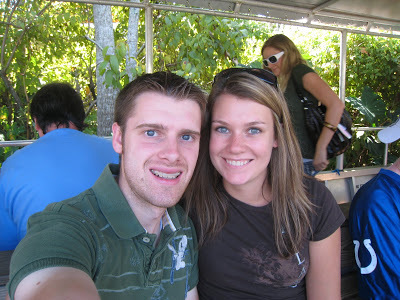 Here we are after getting on the boat that would take us all around the swamp. The first few alligators we saw were small and fairly timid. You can see only his eyes are out of the water. Our guide explained that the number of inches of length on their snout translates into the number of feet the alligator is long. So even though only his eyes and part of his snout is sticking out of the water you can tell pretty accurately how big the alligator is. This one is only about 3 feet long. The picture is a little deceiving, I zoomed in to get this shot. The alligator is only about five or six feet long (they can get a lot bigger). 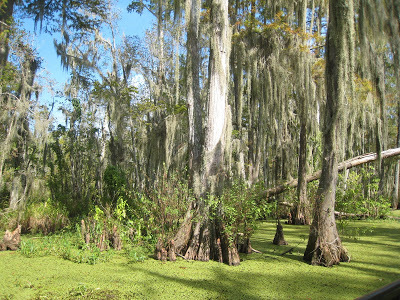 Here is a picture of the swamp and trees. Every year five licenses are given out via lottery to five lucky alligator hunters. The license allows the hunter to kill one alligator. 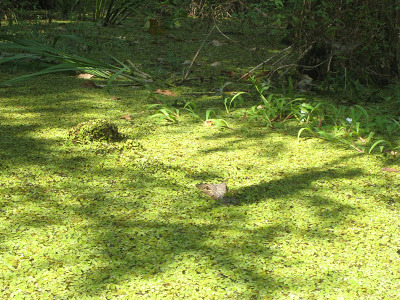 Part of the swamp is a preserve, and hunters cannot hunt in those areas. Because the tours are done several times every day by multiple companies, the alligators grow accustomed to boats and people. 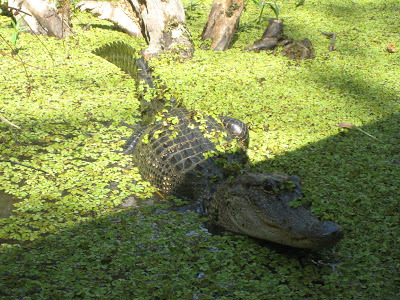 There is one particular large male alligator that the tour guides love to show off. During hunting season though, the hunters know that they are not frightened by the boats so they go after the “trophy” large male alligator in the area. To combat this, some of the companies/guides have tried to feed this alligator in the preserve area so that he has no need to venture out and potentially get hunted. As you can imagine, there is some tension between the hunters and the guides. Apparently, alligators eat both marshmallows and hot dogs. On the tours they feed the alligators both of those. 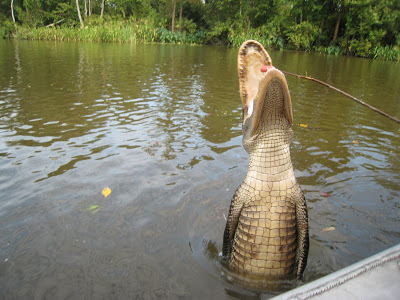 They throw the marshmallows to get them closer to the boat so we can see them and they use the hot dog pieces on a stick to get the alligators to jump up out of the water, like you see in the picture below. They can jump more than half their body length out of the water. 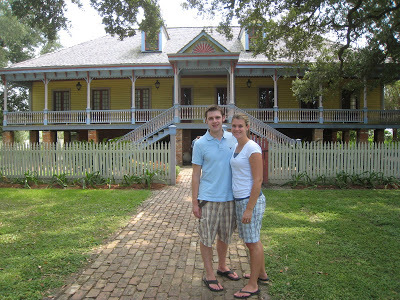 We took a tour of the Laura Plantation, also located a little outside New Orleans. It was a nice explanation of what life was like on the plantation and how all the various people ended up in the New Orleans area. 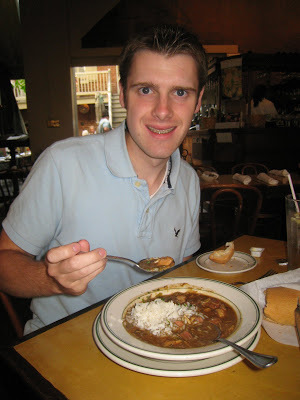 Since we were here and the dish is so popular, we had to try some gumbo. We were nervous, but it actually wasn’t half bad. Here is another picture with our couch surfing host. This is Tavia; we stayed with her for a couple nights while we were in Florida. She took us to Wekiwa State Park which is a natural spring. The water was a little cold, but it was a fun swim. 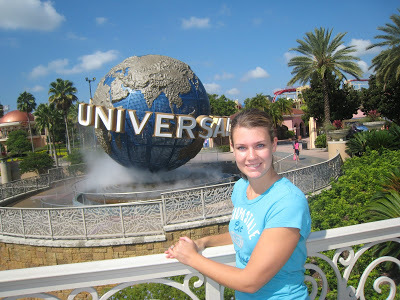 We bought a two-day pass to Universal Studios and Islands of Adventure. We discovered that there was a huge benefit to having arrived in Florida in September (after most schools have started) – short lines! We spent one day at each theme park and we were able to go on every single ride we wanted to, plus our favorites for a second time. 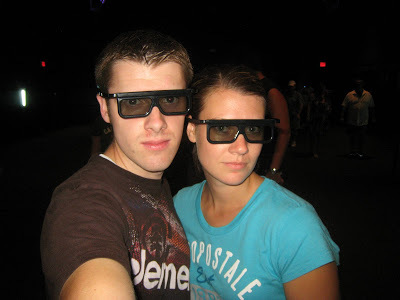 3-D movies! Gotta love the glasses. 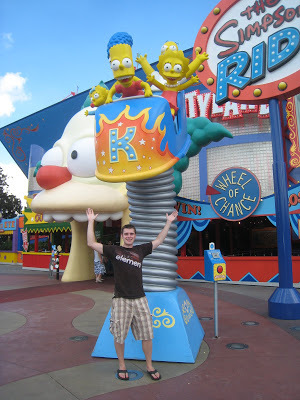 The Simpsons ride was one of my favorites. Its one of those rides where you sit in the car and it tilts you, jostles you, etc. to make you feel like you’re part of the movie you’re watching. We’d been on several of those kinds of rides, but this one did a great job making you really feel like you were in it. I thought it was fun. The next few pictures are from Islands of Adventure. We saw this sign amongst many in the comic section of the park, and we thought it was actually fairly accurate. At this point we’d been on the road for about two months. Moving from place to place about every other day was getting a little tiring, but its hard to take a break when you’re in a city you’ve never been to and may never visit again. 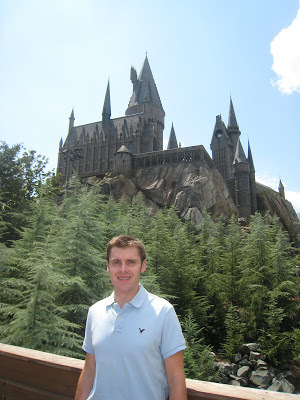 The Harry Potter section of the park was very elaborately done. It was really fun to walk around and see parts of the movie come to life. I think this was all sort of lost on Chris because he’s never read the books or seen the movies 🙂 The ride was pretty cool too. I just had to take a picture of the empty lines for the Harry Potter ride. And this picture only shows about 1/5 of the line queue length. It went on and on… I can only imagine it is possible to wait in line for this ride for hours. I think we waited about 40 mins. We joked that when the “Wait Time” sign said 10 minutes or less that it meant it was a walk on, but it’d take us 10 minutes to walk to the actual ride. 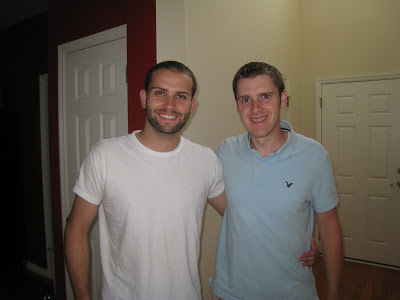 This is Jason, another one of our couch surfing hosts in Orlando. Jason showed us a really great Mexican restaurant near his house. 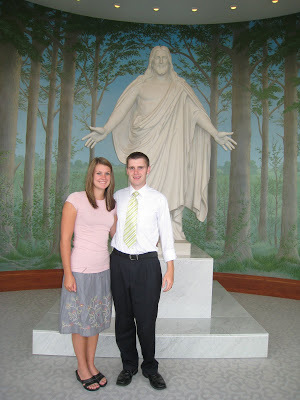 We really enjoyed getting to know him. Unfortunately, our time in these two cities was brief, so we don’t have a lot of photos or stories to share. This is Lee, our host for the night in Charleston. He was a great host and has some awesome stories to tell. One of his major hobbies is sky diving, and I may be slightly less afraid of sky diving now (Chris is working hard to convince me that we should go sky diving someday, we’ll see). Our major activity while in Charleston was going on a carriage ride tour of the city. 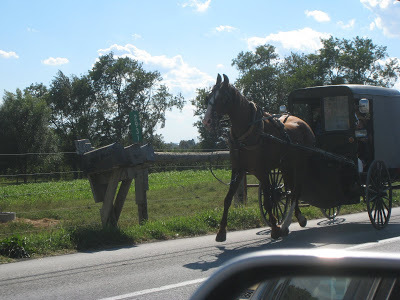 Apparently the carriage rides are governed by a lot of rules so that they don’t interfere with traffic, etc. In the first few minutes of the ride the tour guide was describing some lottery method with pink(supposedly red) ping pong balls rolled out of a bingo spinner. I laughed a little thinking she was telling an exaggerated joke. She was completely serious. Thirty seconds later she stopped the carriage and called out to someone sitting in a booth on the sidewalk. The lady turned the spinner and out came a pink colored ball. The person in the booth called out a number to our guide, and that is how our carriage tour destination was determined. In order to keep only a certain number of carriages in specific areas of the city they use a lottery system. The tour guides never know which of the four tours they will be giving until they stop at the booth and the number is drawn. Kinda crazy, but I guess it works. 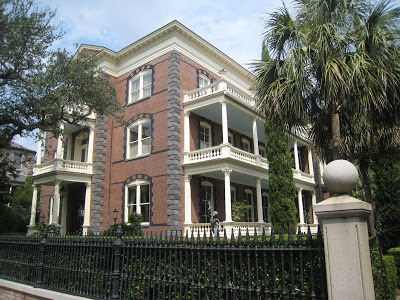 On our tour we saw a lot of the older houses (older is relative because Charleston has burned down and been rebuilt many times). 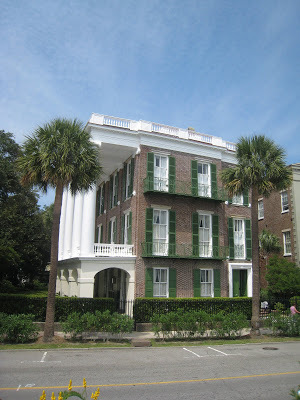 I never would have guessed, but some of the richest people in America live in Charleston. Our tour guide mentioned the Trump children as an example of the people who lived in that area. All the houses have a similar design. The part of the house that faces the street is only one room wide, and they have a patio to help cool the house (very, very essential to life in this hot, humid climate). This is because you were taxed based on how much of your house faced the street (how many “rooms”). Seems like a lot of housing construction was based on taxes back in the day (height of the ceiling, number of windows, portion that faced the street, etc.). This is one of the bigger, nicer homes in the area. I thought the homes were all very unique and beautiful. 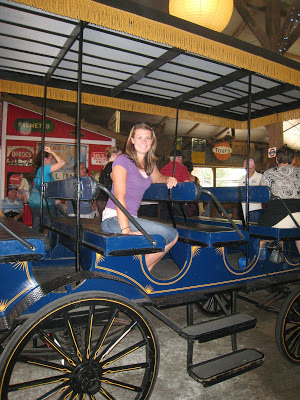 It was an interesting tour… but, it was blasted hot outside and the carriage moved so slowly it did not create any noticeable air flow. I thought I was going to melt. But I’d totally recommend the city—excuse me, the tour on a nice cool, breezy, non-summer afternoon. 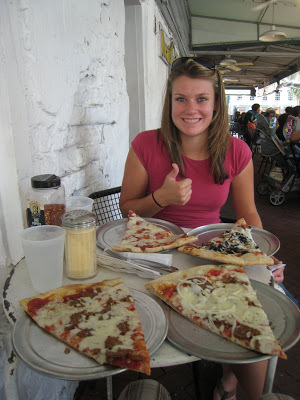 The highlight of our stay in Savannah was pizza, haha. 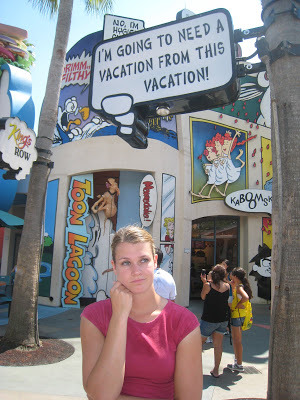 We had to drive to Orlando that day, so we couldn’t stay long. We stopped by a famous pizza place in the area and then drove around a bit to see at least some of the city. 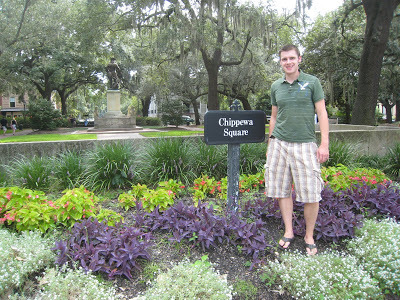 We did make a brief stop at Chippewa Square. Savannah has lots of these squares all over the city. They are just one small square block with trees and beautiful flowers. This square is actually rather famous, well, kind of. Right where Chris is standing is where they placed a bench so that Forest Gump could wait for his bus. That’s right, this is where he sits during the whole movie telling his stories to the other people waiting for the bus. Of course, once they were done with the movie they removed the bench and put it in a museum. We spent a half day visiting Mt. 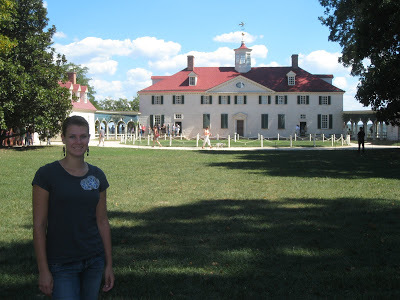 Vernon, George Washington’s estate, while on our way from Pennsylvania to Virginia. This is a picture of the main house, the mansion. One interesting thing we learned on the tour is that the Washington’s had many guest bedrooms because every year they had several hundred guests visit, and many of the guests remained over night or for several nights. 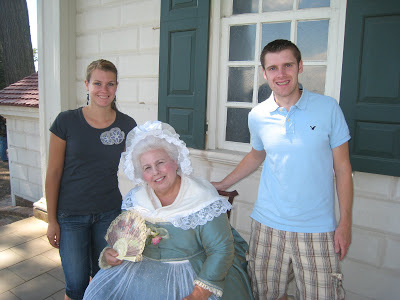 As we walked around the estate we talked with this woman who was answering questions about what life was like when George Washington lived here. Another interesting note, the house, as you can see in the background, is not made of brick. 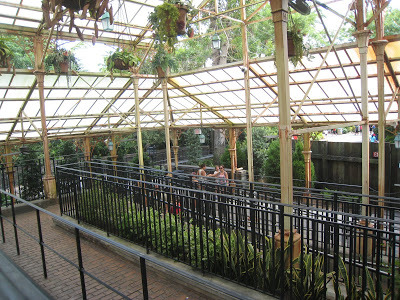 It is built with wood planks that were carved and painted to make it look like it was made of brick. After visiting the mansion and some of the other buildings on the property, we wandered back to the George Washington museum. 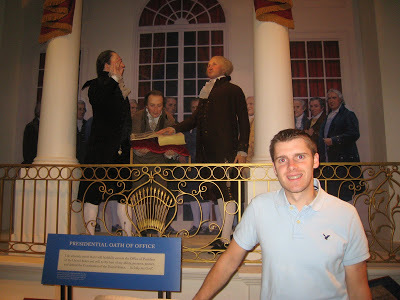 They spent a lot of time trying to create very realistic wax figures of George Washington at various points in his life. Behind Chris is an example of one. It is George Washington at age 57 as he is being sworn into office as the President. There was a lot of cool stuff in the museum. We even saw his wooden teeth! Just kidding. That is a myth. George Washington had severe dental problems throughout his life and had many sets of dentures, but none of them were made out of wood. By the end of his life, he’d had all of his teeth pulled. 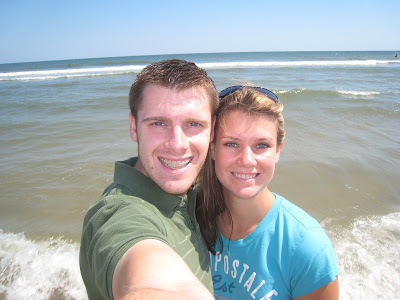 The next day we went to Virginia Beach! This is the first time I’ve set foot in the Atlantic Ocean. It was a great day to be at the beach. 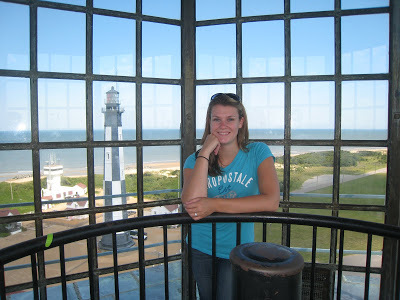 We asked what else we should see while in the Virginia Beach area, and a nice lady told us that we should come see this light house, Old Cape Henry Lighthouse at Fort Story. 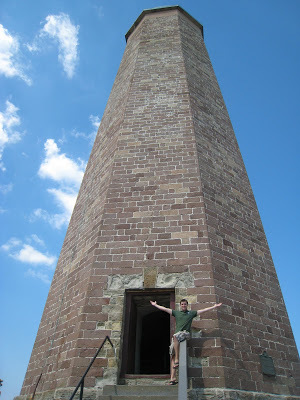 It was built in 1791, and it was the first federally commissioned lighthouse. We climbed aaaalll the way up to the top to see the beautiful view. This is the view from the top. As you can see, there is another lighthouse just across the street from this one. It was built in 1881 to replace the original lighthouse which they thought was deteriorating. We ended our day in North Carolina. 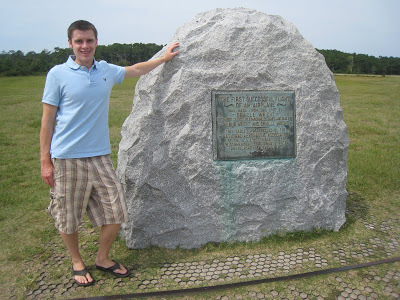 The first flight happened here at Kill Devil Hills, North Carolina in 1903 (In 1903 Kill Devil Hills was part of the city Kitty Hawk, but it isn’t anymore). 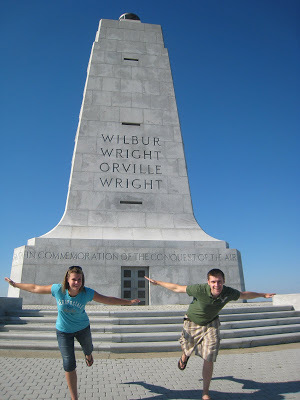 The Wright Brothers had been working for years, and they finally succeeded – the first powered, controlled, and heavier-than-air sustained flight! 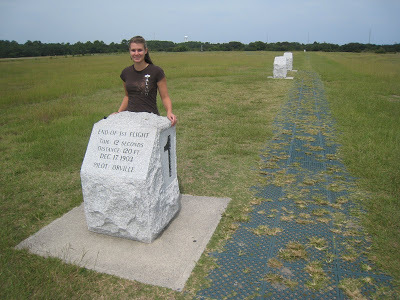 This monument is placed at the top of one of the sand dunes (now covered in grass to keep the dune from shifting over time) where the Wright Brothers often flew in their gliders. 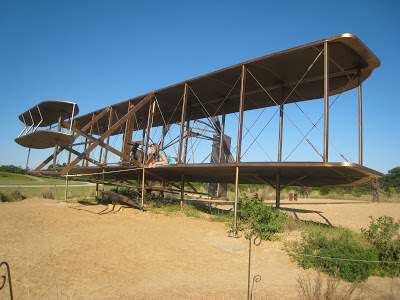 This is a replica of the airplane they flew during the first flight. I wanted to pretend I was flying the plane, so I jumped up next to the statue of one of the brothers. This rock is to commemorate the first flight. This is where the plane took off (not one of the hills). These rocks show the first, second, third and way off in the distance fourth landing spots as they continued their attempts to fly. One of the reasons that they flew very short distances and then suddenly on the fourth attempt they went a lot farther is because they were a little nervous to get too high off the ground. So while they were trying to fly close to the ground they also had to keep the plane steady and straight. They would over correct their steering and the plane would hit the ground. On the fourth attempt (Wilbur was flying that time, they switched off every other) he was a little bit braver and kept the plane higher off the ground. That enabled him to keep the plane steadier, so he was able to fly much farther. The ranger told awesome stories about the Wright Brothers. This is… a strange place. 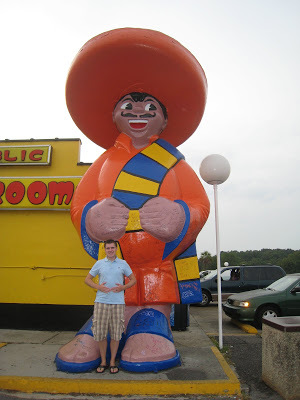 Right as you cross the border from North Carolina to South Carolina you see tons of signs for “South of the Border”. One of our couchsurfing hosts had told us about this place, so we had to stop and walk around. It is just a whole bunch of shops and places to eat, kinda funny. Then we went to the town square/center to check out the shops and events going on there. 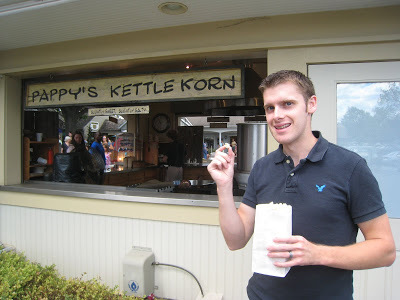 When Chris saw Pappy’s Kettle Korn stand, I knew we weren’t going to get away without buying some. Chris loves kettle corn. We watched them make a fresh batch. It not only smelled delicious, but it tasted delicious too. It is so strange to see so many buggies around. We wanted to learn more about the Amish and how they live, so we asked a lot of questions at the tourist information desk. We learned that there are several different types of Amish people. Some live with very strict rules saying they cannot have electricity, etc. While others have more room to decide how they want to live and if they want to drive cars, use electronics, etc. Here we are – Hershey, Pennsylvania! Mr. Hershey built Hershey, the city, for his workers. He donated a lot of his money to helping those in need. 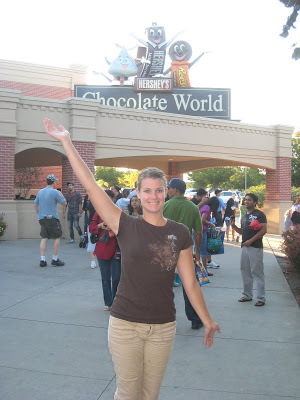 We spent just a couple hours visiting Chocolate World. We went on the Chocolate Tour. It is a short ride that shows you how they make their chocolates. 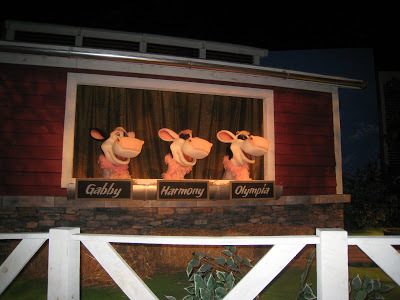 It is a pretty entertaining ride, they even have singing cows 🙂 The best part is that at the end… they give you a piece of chocolate. 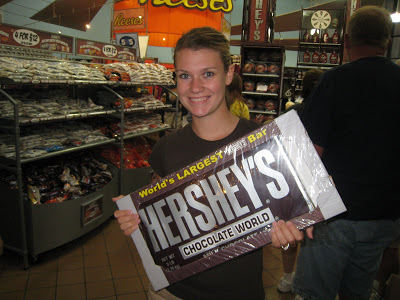 As you can imagine, they have a HUGE shop where you can buy everything Hershey. I’m holding the world’s largest Hershey bar. And no, we didn’t buy it. I think we would have been eating that thing for a couple weeks! 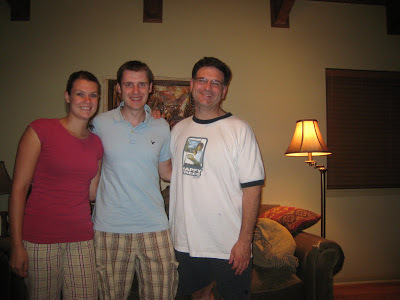 Here is a picture of us with our couchsurfing host for the evening. We stayed with Holly and her family for just one night. Her daughter is so cute; she loved talking to us and showing us her toys. 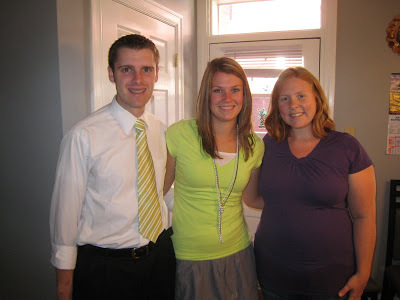 It was so fun to stay with Holly and get to know her and her family. We were happy to be their first couchsurfers. We took a few short hours (can you tell we are starting to run out of days to see everything?) 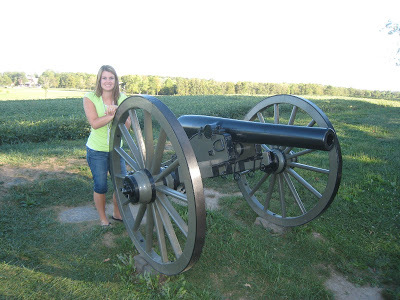 and took a audio tour of Gettysburg. 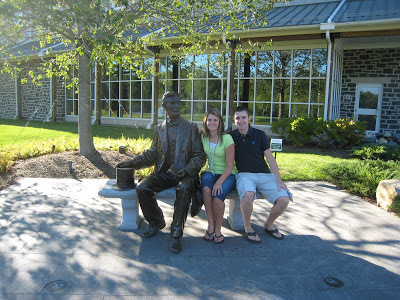 Here we are at the visitor center with a statue of Abraham Lincoln. One of the things that seemed strange to me as we drove around was that the audio tour always talked about gaining the advantage by being on top of this ridge or that hill… but by my standards, this whole area was pretty flat. 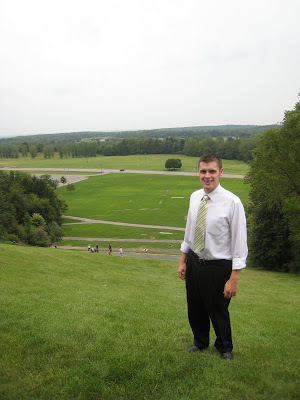 In this picture I’m standing on one of the ridges (later on in the tour I will admit there was a real hill or two). But, these small ridges changed the way the battle was fought. Here is one of the places I think qualifies as an actual hill. 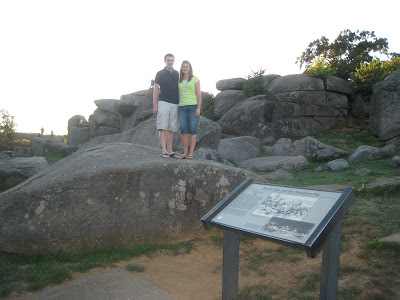 This is called Devil’s Den and nearby was the Slaughter Pen. The names really are a good clue – this part of the battle was very bloody. 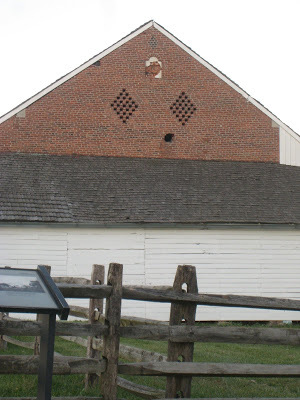 The round hole in the top part of the building is from a cannon ball shot during the battle of Gettysburg. We also learned that while many, many soldiers lost their lives, only one civilian in the nearby town died. Her name was Jennie Wade, and she was shot by a stray bullet. 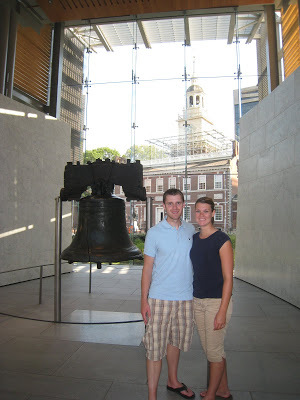 Our visit to Philadelphia was short, but we met some fun people and got to learn even more about US history. Our couchsurfing host had several people staying with her, so we had the opportunity to meet and talk with other couch surfers which is always fun. We drove from New York to Philadelphia on Thursday morning. That afternoon we met up with Judy Becker, our host, and the other surfers as Judy was giving a walking tour around Philadelphia. We came in half-way through the tour, so we missed a few places. One of our stops was the Liberty Bell, which I was excited to see. We took a short tour of the Quaker Meeting House. 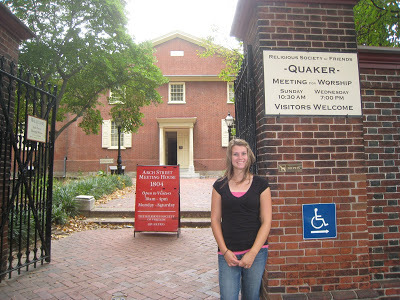 We really learned a lot about the Quakers, what they believe, and how they worship. It was really interesting. They still use this building as a meeting house. 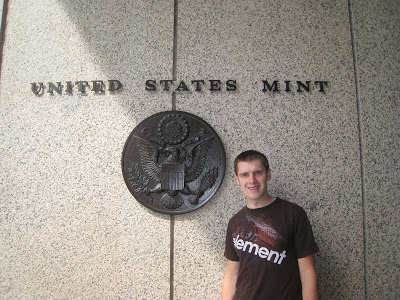 We walked through the US Mint. We were really excited to see how the coins are made, but were a little disappointed when we saw that no one was operating any of the machines. Apparently everyone was on break. On our way out, we talked to one of the workers who answered some of our questions and gave us two smooth pennies that hadn’t been stamped yet. 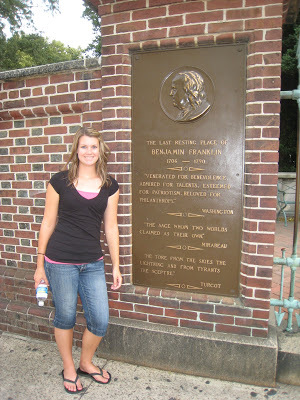 We arrived after the cemetery was closed, but through the gate we could see Benjamin Franklin’s grave stone. After walking down Elfreth’s Alley, one of the oldest continually inhabited residential streets in the country, we stopped to decide where to go next. 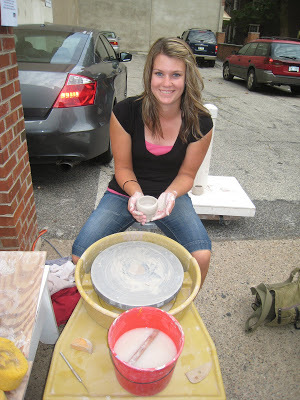 We noticed a man molding a clay pot on the sidewalk. We naturally went closer to watch. He finished and one of the workers said they would let us “throw down” as well. They were trying to get people interested in the classes they offer at the school, so they were letting people try it. Chris went first. His pot was turning out quite well, and they said he was doing a really good job for his first time. Unfortunately, right at the end he poked a hole in it. Then it was my turn. I’d always wanted to try it, and it was really fun. My pot didn’t turn out quite as evenly shaped as Chris’s, but I had a good time. 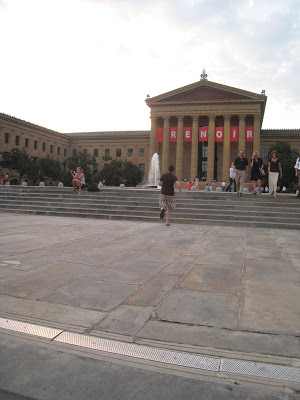 Rocky finished his unforgettable run up the stairs at the Philadelphia Museum of Art. 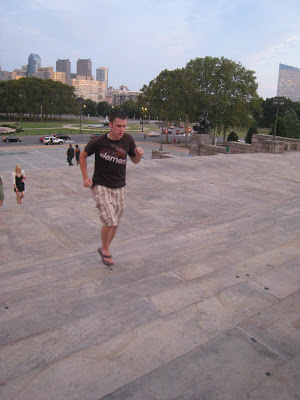 So of course we had to get a few running shots up the stairs. To see a clip of Rocky running up these stairs click here. Now throw a few jabs and toss those arms in the air like you won! These two girls were also staying with Judy while we were there. We drove them around a bit on Friday, because it was hard to get from Judy’s house to downtown using buses and trains. They are from Slovakia, and it was fun to get to know them a little. Another must-do was get a real Philly Cheesesteak. 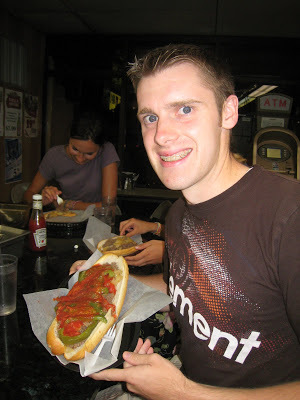 We used yelp to find a restaurant with a really good philly cheesesteak. We were not disappointed. 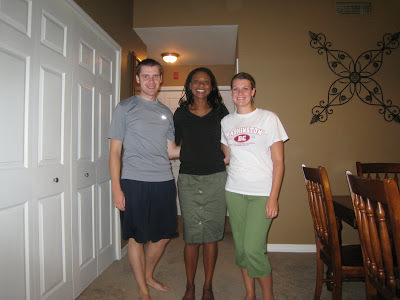 Here is a picture of us with Judy, our host. 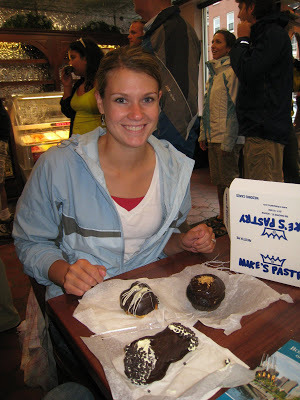 She has traveled extensively in her life. She has so many stories to tell of all the adventures she has had. She gave us a tour of her house and showed us all the many dolls and souvenirs she’s collected from all over the world. 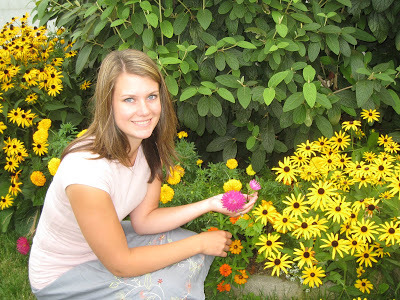 Now she gives back to other travelers by being a couchsurfing host. New York City!! Our favorite stop. We were in New York for a whole week, our longest stop, and we had tons of fun. We bought a city pass for 7 days which would get us into at least 60 different activities, museums, tours, etc. We could see and do as many things as we could cram into 7 days. Museums are expensive, and so if we paid $20+ per person to go to a museum, we would make sure we had time to see everything and spent half a day there. With our New York City pass it was really liberating to be able to go to a museum and stay for as long as you were interested – even if that was only an hour. 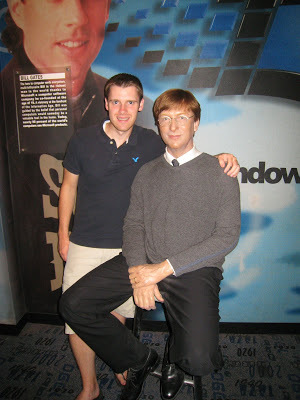 Or go to a wax museum (we’d both never been) just to see what it was like. It was all “free” (we paid a good amount for the pass, but nothing compared to the total cost of each activity). 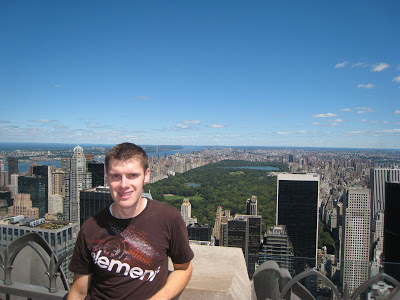 One of the first activities we did was to go to Top of the Rock. In case you’re like me and had no idea what that was, Top of the Rock is the top of the Rockefeller building. While we were at the top and looking out at the city, it seemed strange to see tons of tall buildings all crammed together and then suddenly a huge square of grass and trees, right in the middle of it all. 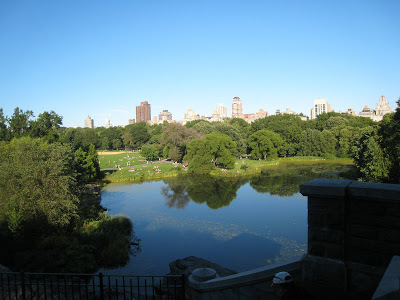 We debated how much we thought Central Park would be worth if they sold the land. 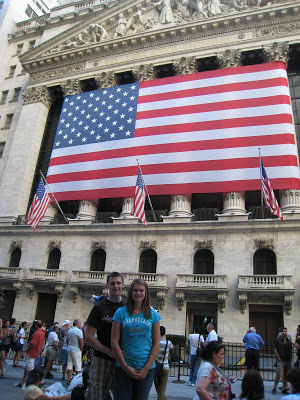 Being two accountants, we of course had to go and walk down Wall Street and see the NYSE. You can’t visit New York without going to the MET. I had heard it was an amazing museum, so I was excited to go. Chris isn’t as interested in art museums as I am, but because he loves me so much he comes with me 🙂 Art is a funny thing. People have very different ideas about what is art and what qualifies as a work of art. Some of the modern art pieces are… debatable in my mind. I often find works of art that I wouldn’t call art. This would be one of those pieces. 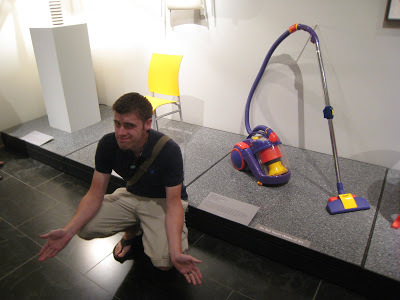 A vacuum? And the yellow chair behind it? Like I said, debatable. As you can tell from his expression, I think Chris agrees with me. As we walked around and discussed what is art, I asked Chris to point out a painting that he thought qualified as good art. Below is a picture of what he chose. 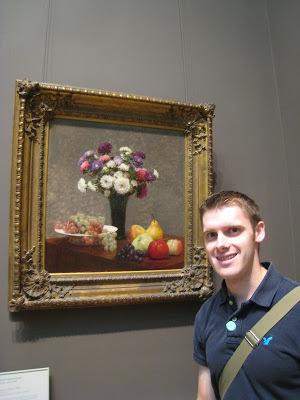 For those of you who know and love Brian Regan, in one of his shows he described how he would judge art. Forgive the terrible quality, but if you can understand him it’s really funny. Click here to listen to Brian Regan. We took a walk around Central Park, and I can only imagine that the people living in New York just love coming to visit Central Park. Its the only way to really escape the city. And if you walk deep enough into the park, the trees hide all the buildings and you can enjoy nature. It really is a beautiful park. We took the ferry to see the Statue of Liberty. If you plan in advance, you can get tickets to either the pedestal or if you are lucky, the crown. We didn’t know this was a possibility, so we were not expecting to stay very long on the island, just take a few pictures and go. We happen to walk by the sign that said the ranger led tour would start in 2 minutes, so we waited. The ranger gave a very good tour, and I really learned a lot. At the end of the tour, Chris asked some question about how to get up onto the pedestal. The ranger asked if any of us had tickets to get up there. No one did. So, for some reason he said he’d let our whole group go up to the pedestal. 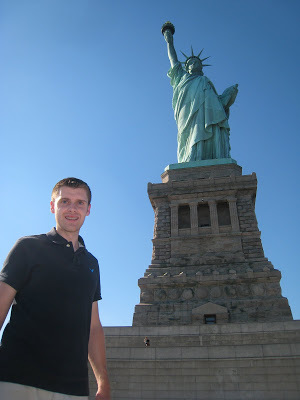 In the pedestal, they have a museum about the Statue of Liberty. 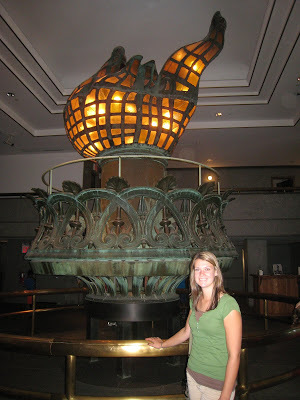 The picture below is of the original torch. It used to be all copper, but then they wanted to make the torch light up, so they cut holes in the copper and put in these square of glass so that the light from lamps would shine through. In the 1980s they replaced the torch because this one was so badly damaged. Water was constantly leaking in and repairs were frequently needed. The new one they made was an exact replica of the original, except this time they covered it in gold so that it would still appear as though the torch was lit. 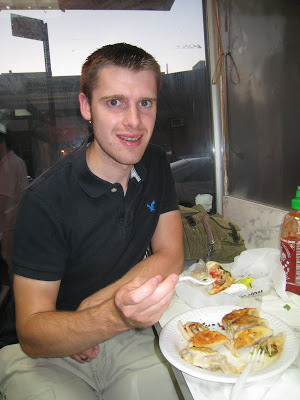 We found a restaurant in China Town that served dumplings and a few other items for a really, really great price. We got 10 dumplings for $2. The sesame pancake was also highly recommended, so we tried one of those too. The dumplings were delicious, and both of us ate dinner for $4. That’s pretty amazing, especially for New York. 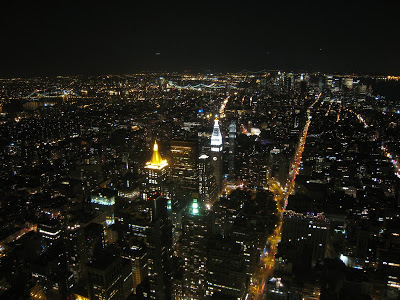 Though we had been to the Top of the Rock, we decided we still had to go to the top of the Empire State Building. It’s a must see. We decided to mix things up a bit and go at night. It was a gorgeous view of the city lights. 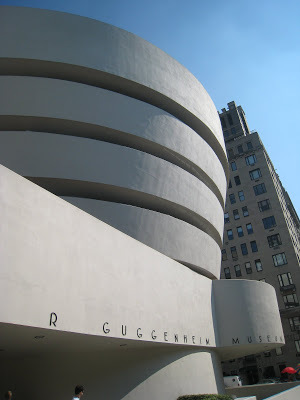 We went to one more art museum while we were in New York, the Guggenheim Museum. This is another Frank Lloyd Wright building, and I just had to see it. We didn’t spend a ton of time in the museum because there was a lot of modern art 🙂 That’s not our love, so we just saw a few of the highlights and took some pictures of the building. This building certainly stands out amongst the normal tall, boxy sky-scrapers. It is very unique in NYC. 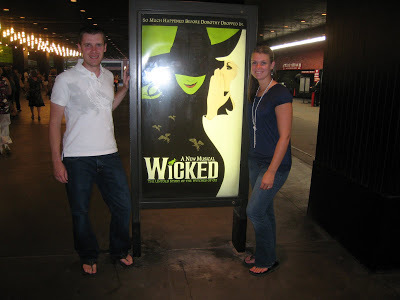 One of the highlights was of course… Wicked! It is such an awesome show, and I would definitely recommend it to anyone. We loved it. You never know who you’re going to meet in New York! This is Bill Gates! Ok, just kidding. We stopped by the wax museum. We had a great time taking pictures here. We also have to give a big thank you to Scott & Julianne Parmenter who very kindly let us stay with them for a few days. Thank you, thank you! We had a great time in New York, and we look forward to going back someday! 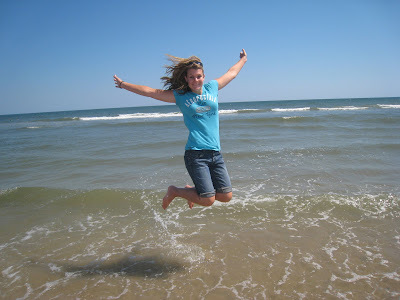 https://thejonesaccount.com/wp-content/uploads/2010/10/IMG_6280.jpg 300 400 Brittany https://thejonesaccount.com/wp-content/uploads/2016/05/jonesaccountlogo-2.png Brittany2010-10-10 04:23:002016-05-10 05:34:54New York City!! Our favorite stop. Chris and I finished our long road trip about two weeks ago (of which I’m still going to finish blogging about) and moved to San Jose. We are getting settled into our new apartment, and we’re thrilled to be staying in one place for more than two days. Chris starts his new job on Monday, and couldn’t be more excited about it, haha 🙂 Over the next few weeks I’ll be studying for the CPA exam. So, that’s the update! As we drove from Rochester, NY to Boston, MA it started to rain. It sprinkled and poured, and rained and rained until the day we left Boston. Rain or shine we decided we had to get out and see the sights anyways. 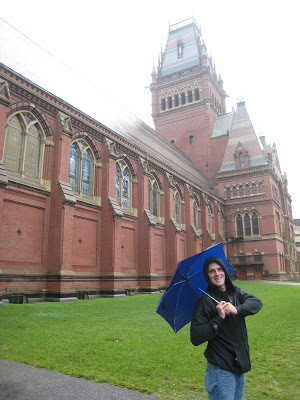 We spent a few hours touring around Harvard campus. This is a statue of John Harvard. We just saw the movie The Social Network which takes place on Harvard campus. A scene in the movie called this the statue of three lies. According to the movie, John Harvard was not the founder of Harvard, this is not actually a statue in the likeness of John Harvard, and the date is wrong on the statue is wrong. After verifying this on wikipedia, the movie is correct. 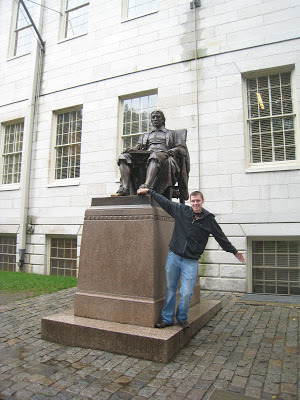 Of course, we didn’t know all of that when we were here, but I probably wouldn’t have remembered that scene in the movie if we hadn’t been here and touched John Harvard left shoe. Mike’s Pastry was recommended by tripadvisor.com and several other people, so we had to go check it out. The lines can go out the door at this pastry shop. We got a peanut butter cupcake, a boston creme puff (of course), and a cannoli. Waaaaay too much sugar for one sitting, so we saved some for later. The cannoli, which we’d never had before, was actually really good. It was fun to try something different. 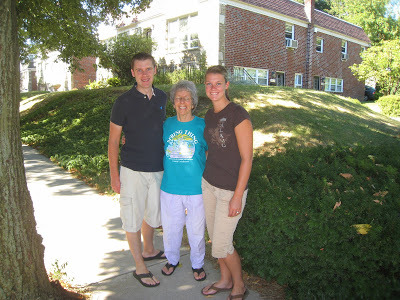 We stayed with a fun family, the Heinemans, in Brookline just outside of Boston. 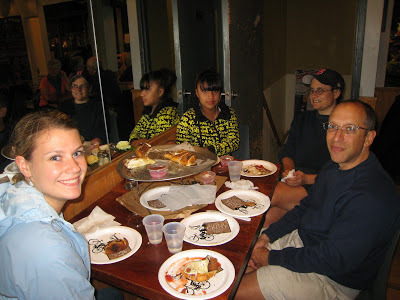 They showed us around their town, and we went to a local pizza place and got dinner together. This is a very small shop on the main street in Brookline. The Heineman’s pointed out this shop when they showed us around. 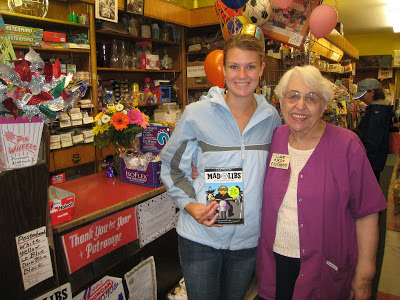 They said that this lady has owned and run this little shop for many, many decades. We stopped by when the shop was open and bought some mad libs for the road. 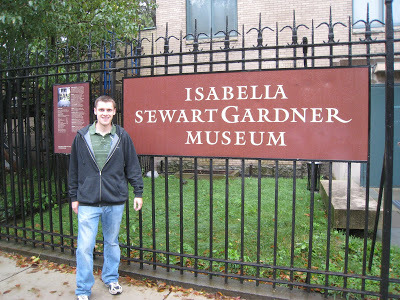 We went to the Isabella Stewart Gardner Museum, which was nice because we could stay out of the rain for awhile. This is a very odd museum. Isabella was a woman of wealth who lived from 1840 to 1924 who created this museum. She had been collecting art for many years when she decided to build a house (huge mansion) to display the art she had been collecting. It is unlike modern museums where every picture is labeled, at eye level, in a rather plain looking room. This “museum” is filled with art (tapestries, tables, chairs, vases, paintings, sculptures, chests, etc.) all along the walls in every room top to bottom, nothing labeled like a house would be decorated. The museum is also very dark now. She had huge windows with her favorite paintings by the windows so they could have the best light, but for preservation they have covered the windows, and there is minimal lighting installed for us today. 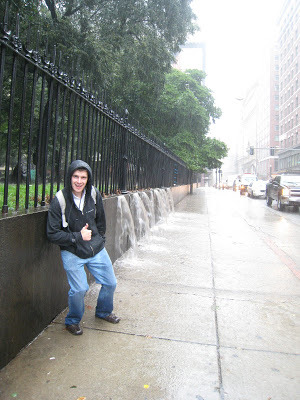 Like I said, it rained the whole time we were there, and I really wanted to walk the freedom trail which is…. outside. So, on possibly the worst day (but the last full day we were there — we had hoped the rain would stop after a couple days) we went out and walked the freedom trail. We had headsets that talked about each stop as we walked from place to place. When we found something we wanted to take a picture of we would get the camera ready, jump out from under the umbrella, and snap a quick photo before hurriedly jumping back under the umbrella. This is one of those pictures. 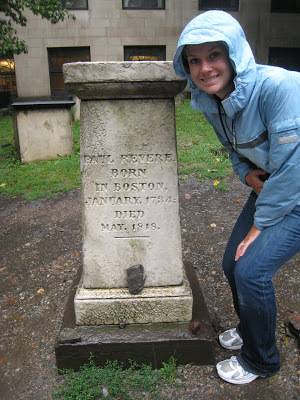 It is Paul Revere’s grave. This is where my shoes got soaked. It wasn’t really possible to just jump over this. Behind the fence is the cemetery where Paul Revere is buried. 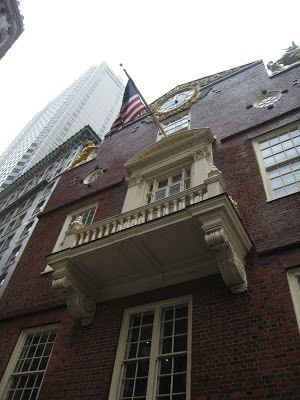 This is the Old State House, one of the places where the Declaration of Independence was read to the public. Standing at this spot, if you turned around, you would also see the square where the Boston Massacre occurred. 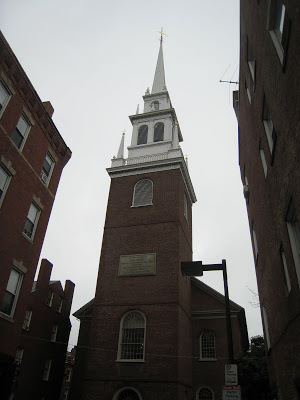 This is the church where Paul Revere hung the two lanterns to warn that the British were coming, “one if by land, two if by sea”. To this day it is a functioning church. 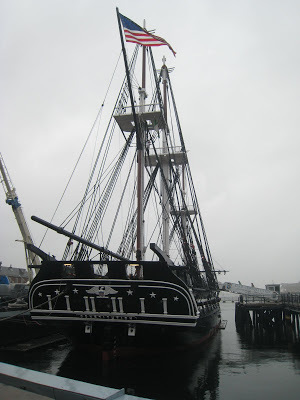 This is the USS Constitution. It is the world’s oldest floating commissioned naval vessel. It also had the nickname “Old Ironside”. It was fun to go down on the lower decks and see how the sailors slept and worked. We got really wet, but it was so worth it to get out and learn some of our nation’s history. 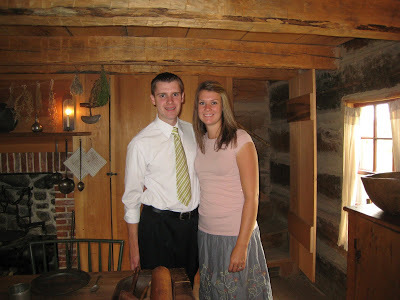 In the picture below we are in a replica of his family’s log cabin. It is a small three room cabin with an attic where all of the kids slept. We learned that in 1830 you were taxed based on the height of your roof, so they had a very low roof even though they were all fairly tall. 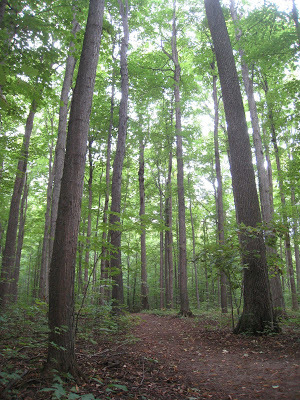 We took some time to walk around the Sacred Grove and ponder and pray. You can feel that this is a very special place. It is wonderful to feel the spirit so strong. The Sacred Grove is such a peaceful, beautiful place. I know why Joseph chose this place to pray to our Heavenly Father. 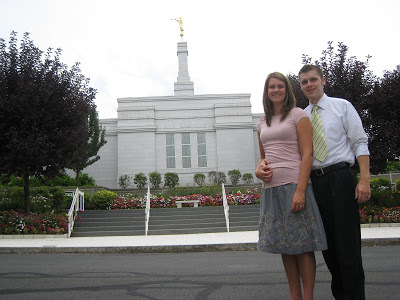 We walked around the Palmyra temple after visiting the Smith farm and Sacred Grove. This is the only visitor center that has the Sacred Grove behind the Christus statue. 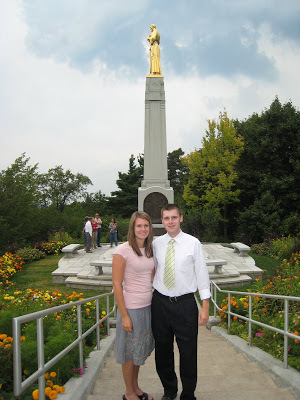 Here we are on top of the Hill Cumorah. It is actually a really tall hill. It is hard to tell, but we tried out best to capture that in a picture. 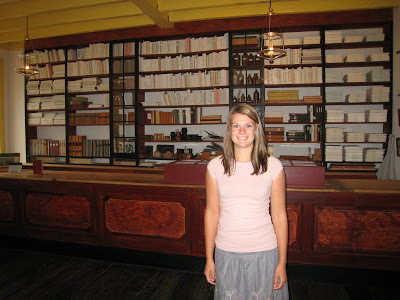 We took a tour of the Grandin Building which is where the Book of Mormon was first published. 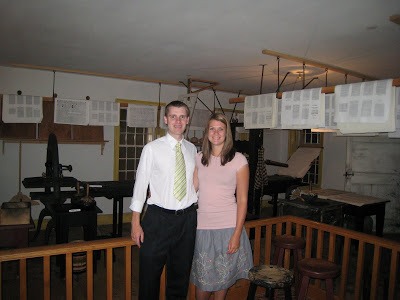 It was quite miraculous that they had available to them a print shop with the capability to print the Book of Mormon.